Sometimes I like to jump on my bike and ride for the sake of riding. To tear through (I mean meander) country lanes till my tank is almost as empty as my adrenal glands. And then I like to find my way home again. Which sometimes is easier said than done. 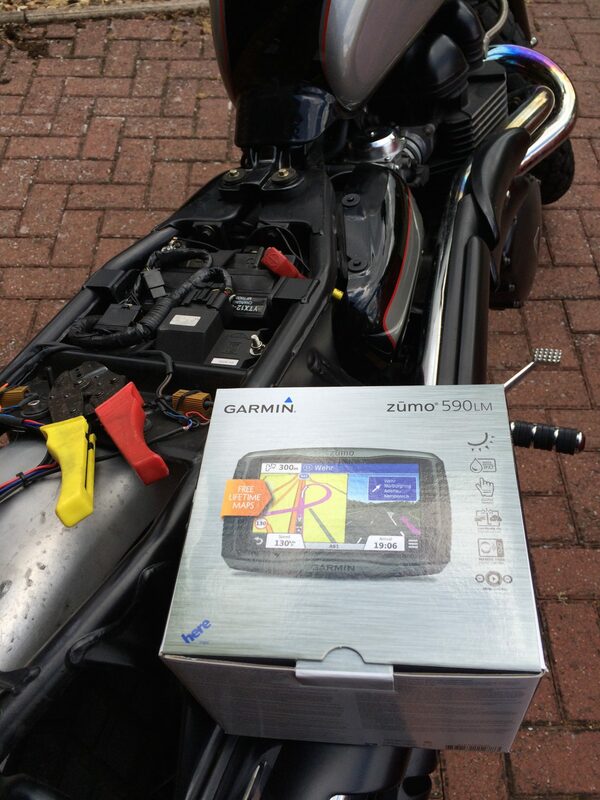 Garmin sent me the Zūmo 590LM to review a little while ago. 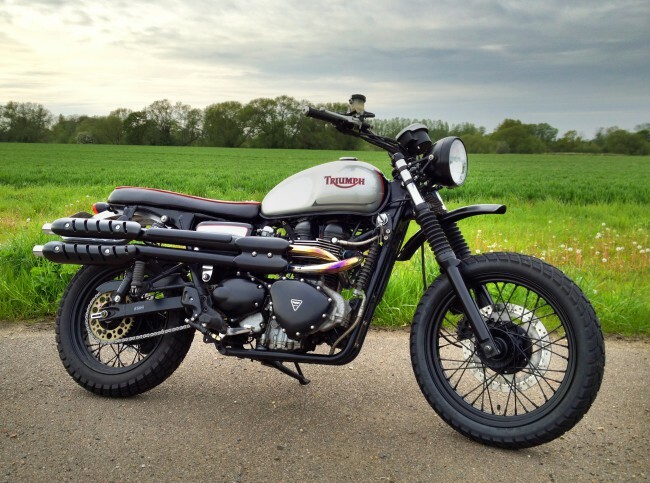 The week it arrived I took a corner a little low and broke my Triumph. Now fixed and back on the road, I’ve been testing the Zūmo while out and about on a variety of two and four wheeled excursions. 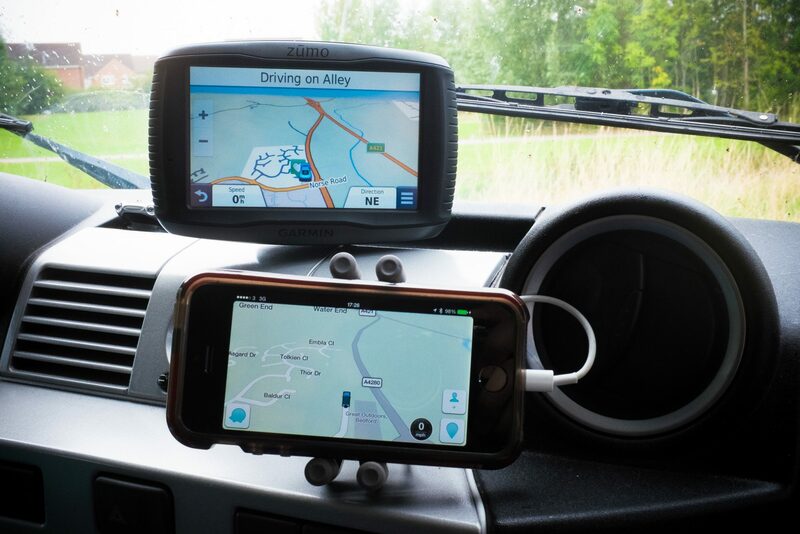 Although designed specifically for use on a motorbike, the device also comes with a decent car mount. 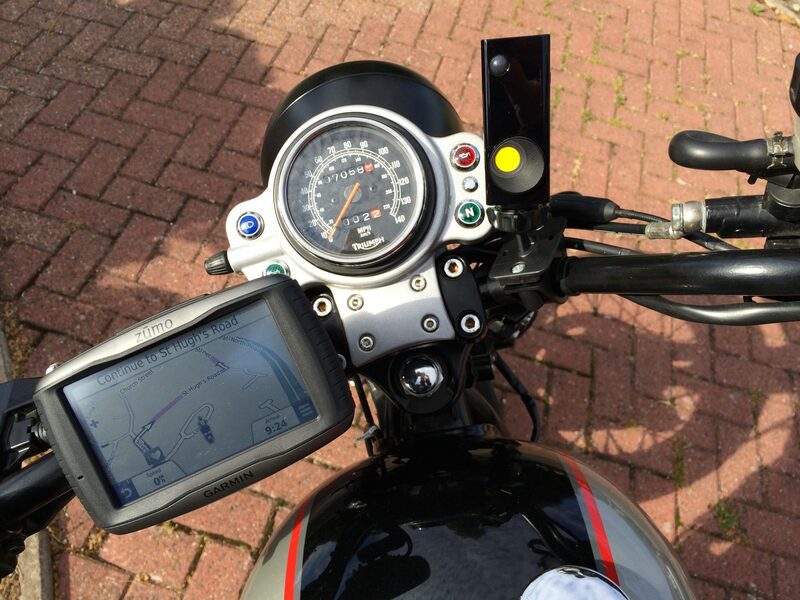 This means it feels equally at home switching between your handlebars and a windless, dry dashboard. I have used motorbike specific satnavs before and used to have the TomTom Rider. It did the job but I inadvertantly blew it up when experimenting with solar charging options. For testing on the bike I decided I’d wire the Zumo into the battery. This way I’d avoid the temptation for any more destructive experimentation. After the death of the TomTom and before the delivery of the Garmin, I used my iPhone for navigation. Not ideal for lots of reasons, but handy as I have it with me anyway. I bought a cheap ‘weatherproof’ iPhone case and used a variety of apps. I would use Google maps occasionally. Apple Maps if I was in an adventurous mindset and didn’t mind random destination and arrival times. And the app Waze. This delivered accurate mapping and realtime traffic info, combined with invasive scraping of my location and movement data. Remember, free apps are never free. Although the navigation app Waze has reluctantly become my goto navigation tool, in some ways the hardwired Garmin Zūmo has been a revelation. My initial observations were it’s fast start up time. I have a low cost Garmin Nūvi for the car and the start up time much slower than the Zūmo. Not only that, but after programming the destinations, it plotted the route in a couple of seconds. Granted, the Zūmo cost £420 more then the £70 I spent on the Nūvi. But if I needed an all weather GPS navigation for work, I’d want to invest in all the whistles and bells. As I know many folks have settled into using their phones to find their way, I’m going to compare the functionality of the Zūmo to the app Waze. For all it’s scary privacy issues, Waze’s use of the community to map and curate traffic info is quite amazing. Boasting some of the most accurate, up to date maps out there. I think if you don’t have a bike specific device you are most likely using your phone. Some bikers I know just have their phone in their pocket, program the route on setting off and listen to the audio directions via headphones. So, aside from the Zūmo’s great response time and rerouting, the fact that you are able to get hands on and use gloves is a huge win over having the phone in your pocket. Or even on the bars. Without buying special bike gloves iPhones are unresponsive to gloved hands. The Zūmo is also rock solid and weatherproof. Able to stand driving rain at speed and easy to see with it’s large vibration free screen. Even unwired, battery life is also much better than my iPhone, but no surprise there. 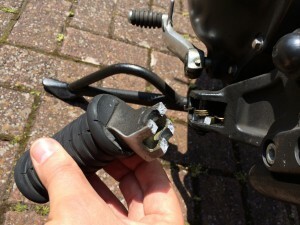 After wiring mine to my bike battery I now have no need to charge. There were other connectors on the power lead for audio etc but I just taped those to one side. This does of course mean I miss out on traffic data which on four wheels (or a bike bigger than mine) is vital. When I tested the Zūmo in the car I ran it alongside Waze. Often the routes offered were completely different if there were traffic issues ahead. Love it or loath it. Waze has got me out of and around of some serious delays. On one occasion I would have missed a plane without it. It’s all down to their blanket tracking of their users. There are times when I’m thankful for that. But if you’re not keen on the privacy implications when using Waze, Garmin offers easy to find privacy controls. Allowing you to choose what data you would like to log and share. Although rugged and built to bounce down the road, I found the Zūmo cluttered my handle bars. It’s the sacrifice you must pay so you can see all you need in a glance. The last thing I want is to be hunting for information and not looking at the road. I’m tempted to upgrade my helmet with some bluetooth audio to get directions that way. The Zūmo does have speed camera alerts. But again, nothing like Waze’s realtime user curated camera alerts. You can see even the sneaky Policeman hiding in a hedge. Intuitive and made with the biker in mind, If Garmin could offer a free data connection some Amazon Kindle models they’d be on to something. They could learn so much from their users realtime data and as a result, offer world class up-to-date traffic info. Or they could make better apps allowing painless bluetooth pairing to the connected devices we already carry. In a car I must say, as personal data leaky as it is, I opted for my phone and Waze over the Garmin Zūmo. On a bike, for which it’s designed and when traffic can be squeezed past, I reach for the Zūmo every time. Nice blog Christian, very interesting read.